Gallia Academy senior Caleb Greenlee rolls his opponent onto his back during, during a 113-pound match on Wednesday in Centenary, Ohio. Gallia Academy junior Boo Pullins picks up an Ironman, during a non-conference tri-match on Wednesday in Centenary, Ohio. CENTENARY, Ohio — You win some, you lose some. 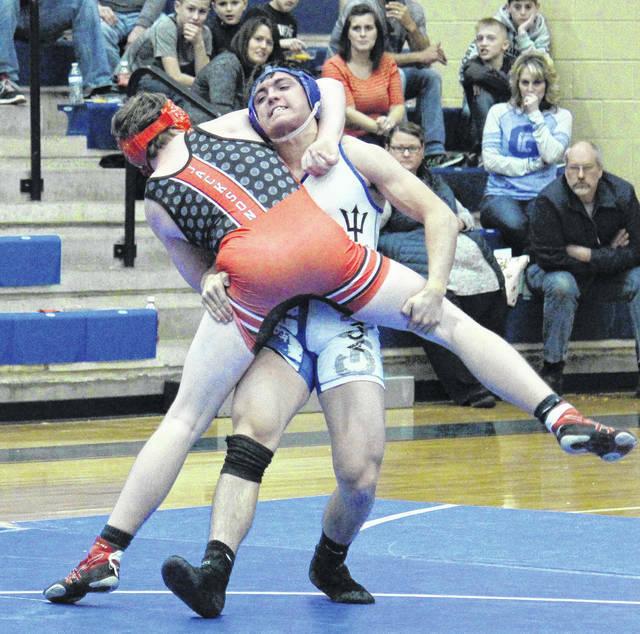 The Gallia Academy wrestling team did both in a non-conference tri-match on Wednesday in Gallia County, as the Blue Devils topped Unioto, but then fell to Jackson. After the Ironmen defeated Unioto in to being the night, it was Gallia Academy’s turn to take on the Shermans. 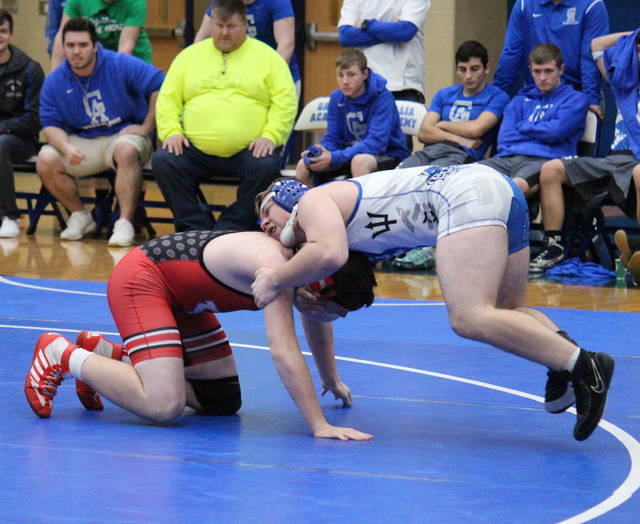 The Blue Devils had earned a 52-18 victory over UHS, with only four weight classes being contested. GAHS junior Trentin Waller picked up a first period pinfall in the 152-pound class, while fellow junior Kenton Ramsey earned a 10-2 decision at 113 pounds. In the other two contested matches, Tristin Crisenbery and Corbin Walker lost via pinfall in the 138 and 145 class respectively. Picking up forfeit victories over UHS were Blue Devils Jason Stroud (106), Justin Day (132), Kenny Siders (170), Boo Pullins (182), Logan Griffith (220) and Hunter Terry (285). The Blue Devils fell to Jackson by a 51-30 tally, with one forfeit win going to each side. 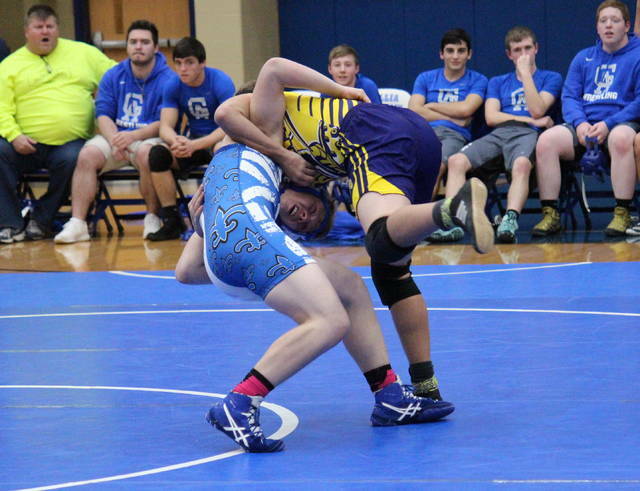 Picking up pinfall victories for Gallia Academy were Pullins in the 182-pound class, Griffith at 220 pounds, Stroud in the 106 bout and Caleb Greenlee in the 113 category. The Blue Devils’ forfeit win came from Kyle Greenlee at 126 pounds. The lone bout between JHS and GAHS that went to decision was at 145 pounds, with Crisenbery falling by a 5-3 count. Gallia Academy wrestlers losing by pinfall to the Ironmen were Waller (152), Siders (170), Mullins (195), Terry (285), Day (132), Grant Bryan (120) and Bronson Carter (145). The Blue and White will wrestle again on Dec. 30 when they host the Coach’s Corner Classic.